» The Cellerciser Rebounder Review – Is It Really Good? Nowadays, many people are discovering rebounder training as a way of keeping fit and healthy. Not only does it offer a complete cardiovascular workout, but this form of training is very gentle on the joints. 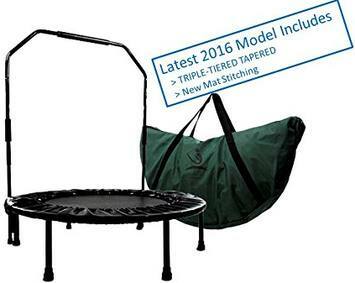 If you're considering adding rebounder exercise to your wellness routine, you may want to purchase your own mini trampoline for home use. In this article, we will review Cellerciser, which is a popular brand that offers two models of rebounder. So, read on for our Cellerciser rebounder review. What makes the Cellerciser rebounder stand out? How does Cellerciser compare to other brands? Where do I find the Cellerciser rebounder for sale? Unlike many other manufacturers, Cellerciser offers two different rebounder models. Not sure which is best for you? Never fear! 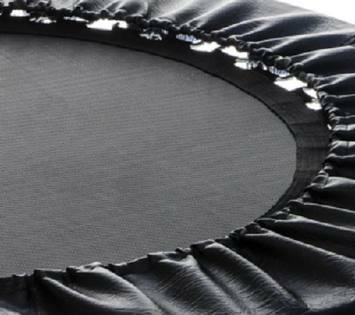 We've created a comprehensive guide explaining the features and benefits of both, so you can choose the mini-trampoline that's best for you. Sturdy construction: The frame of this rebounder is made from 100% strong and durable steel. The frame measures: 40" in diameter, and the jumping matt measures 28". ​Folding and easily portable design: This rebounder is specially designed so it can be folded in half. 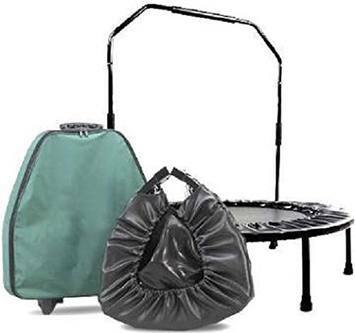 It comes with a convenient carrying bag so you can take your rebounder around with you. ​Stability bar: The rebounder features an adjustable stability bar, and has 3 heights. Therefore, you can select the height that is most comfortable for you. A stability bar is a great feature, as it provides extra safety and prevents you from overbalancing. This is especially useful for anyone with stability issues. Complimentary DVD: The rebounder comes with an exercise DVD included. This contains guided workouts by the trainer David Hall. Check the David Hall's Cellerciser rebounder latest price on Amazon here. Carbon steel springs: These give improved bounce and are stronger and more durable than regular steel springs. Fully foldable: This design can be folded up smeller than the previous model, and includes a carry case. This is great if you travel for work and want to exercise while you're away. ​Complementary DVD: This model also includes a DVD which shows you how to exercise effectively with your rebounder. Adjustable stability bar: If you have trouble with balance, then the stability bar gives you extra security. Some users have commented that they have found this useful when returning to exercise after surgery, illness or injury, as it helps to maintain balance. Check the Cellerciser TRI-FOLD latest prices on Amazon here. You'll be pleased to know that both types of Cellerciser rebounder have received glowing customer feedback. Several users have commented that the Cellerciser is a significant improvement on other rebounder brands, as it is very durable and high-quality. Lots of customers have said that their rebounder has helped them to effectively lose weight, increase muscle tone and even recover strength after surgery or injury. Another stand-out feature of these rebounders is the exercise DVD, as it means you do not need to attend a gym or special class to learn how to rebound effectively. Furthermore, the portability is very useful. This means you can take your rebounder away with you to stay active on vacations or business trips. If you're considering investing in a Cellerciser rebounder, it's only natural that you'll want to know how they compare to other brands on the market. Therefore, we've compared these products to other leading rebounder brands available for purchase. Both Bellicon and Cellerciser rebounders have a strong and durable steel construction. However, the Cellerciser uses springs to achieve bounce, whereas Bellicon uses elastic bungees. Whilst both give a smooth bounce, the springs of the Cellerciser are noisier than the Bellicon's bungees. 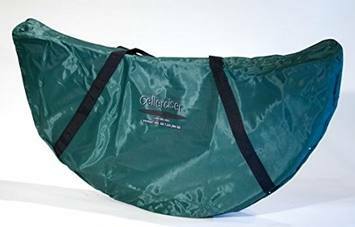 If you're hoping to take your rebounder around with you, or want to be able to fold it up and put it away to save space, then you may find that Cellerciser provide the better option. Their rebounders are fully foldable and include a carry case, whereas Bellicon models cannot be folded. Finally, Bellicon rebounders are more expensive than the Cellerciser models. If you're on a budget, then Cellerciser may well be the way to go. Like the Bellicon model, the Jumpsport rebounders use bungees instead of springs. If you don't want any squeaking while you bounce, then the Jumpsport model may be a better option for you. Also, the Jumpsport models are a little cheaper than Cellerciser rebounders, making them more budget-friendly. However, Jumpsport rebounders do not come with stability bars as standard. You have to buy these as separate accessories. Therefore, if you have any issues with balance or are new to rebounding, then Cellerciser rebounders may suit you better. Finally, the Jumpsport rebounders are not foldable or portable. 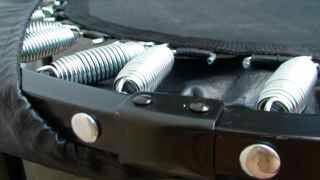 So, if you are tight on space or travel a lot, the Cellerciser's folding design and carry case are a major point in its favour. Both Cellerciser rebounders have an upper weight limit of 300 lbs. We are very impressed with the reviews of the Cellerciser rebounders from satisfied customers, and believe they are a high-quality product. In particular, we think their foldable design complete with carry case is a great feature, giving excellent flexibility for customers. Also, the fitness DVDs are a nice added extra, as they allow users to exercise effectively without shelling out on gym membership. The one improvement that could potentially be made is the use of elastic bungees. This would create a quieter product, more suitable for people who don't want to disturb family members or housemates. However, given the high quality of the products, a few squeaks here and there probably won't be an issue for most purchasers. Both the Cellerciser models reviewed in this article can be purchased on Amazon. Click here to check the latest prices on Amazon. Overall, our impression of Cellerciser rebounders is very positive. We would especially recommend either model for anyone looking for a rebounder that they can take around with them, or for those who have a small living space. Hopefully, now you've read our Cellerciser rebounder review, you'll be one step closer to deciding whether one of these mini-trampolines is the right option for you. Happy bouncing! Click here to buy it on Amazon.